Faith Through the Storm is the memoir of a true American hero, Major James Capers, Jr., USMC (retired), who voluntarily served his country for over 20 years, including a tour in Vietnam, which defined the rest of his life. 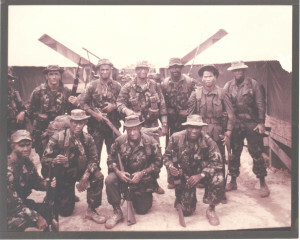 In 1965, Capers volunteered for duty in Southeast Asia with the Marines newly formed 3rd Force Reconnaissance Company. He participated in over 50 covert reconnaissance missions out of Phu Bai and Khe Sanh, five major campaigns, four amphibious assault landings with the 26th Marine’s Special Landing Forces, and including Operation Double Talk, in which his patrol attempted the first ever rescue of American and allied POWs being held in a prison camp 20 miles behind North Vietnamese lines. On March 31, 1967, three weeks before his deployment home to the states, Lt. Capers, his nine-man Recon patrol, and their war dog, King, embarked on their last patrol. Their mission was to destroy a reported North Vietnamese Base Camp in the area around the village of Phu Loc. By their fourth day of patrol, the team had already encountered eight firefights against the enemy while doing reconnaissance on four separate trails. Ordered by an inexperienced captain to reconnoiter a trail previously cleared, Capers and his team pushed on, following orders. The NVA were waiting for them. Exhausted, low on food, and ammo Capers and his team were ambushed. King alerted, but not before claymore mines exploded on the trail with the German Shepard taking the full brunt of the explosion, but protecting the men behind him. In spite of the entire team being severely wounded by the claymores, they held off enemy attackers three times their number for over an hour until finally evacuated by the 26th Marines. All nine members of Team Broadminded were critically wounded in the ambush, with Capers sustaining nineteen wounds and a broken leg, yet still able to inspire and command his team. The only fatality was the team war dog, King. For their action on this mission, Capers was nominated for the Medal of Honor, albeit 43 years later, and thus started the beginning of a Marine’s fight for the honor and recognition of his team members, known as Team Broadminded. A soft-spoken man, his commendations offer an inspiring view of his heroism and self-sacrifice. Jim’s commendations include a nomination for the Medal of Honor, induction into the inaugural class of the Commando Hall of Honor, a Silver Star, two Bronze Stars and Combat V, three Purple Hearts, Vietnam Cross of Gallantry, a Joint Service Commendation Medal, Battle Stars, Navy Commendation Medal, Navy Achievement Medal, and multiple letters of Merit, Appreciation, and Commendation. As an African-American, his achievements included being the first enlisted African-American Marine Officer to receive a battlefield commission (Vietnam), the first African-American to command a Marine Recon company, and the first African-American selected to represent the U.S. Marines in a national recruiting campaign. Major Capers: The Legend of Team Broadminded is an honest and unflinching biographical documentary that portrays the extraordinary life story of Major James Capers, Jr. an American hero, who persevered through adversity and after 50 classified missions rose to become one of the most decorated Force Recon Marines in history. Capers and his Recon team, aptly named “Team Broadminded” overcame stereotypes and seemingly impossible missions, changing the course of history.